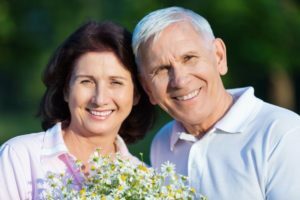 Can I Combine Dentures and Dental Implants in Dallas? Do you have ill-fitting dentures that you wish you could replace? You’ve already had to suffer from tooth loss, so the last thing that you want to experience is additional dental problems concerning a slippery, uncomfortable prosthetic. If you’re ready for a more permanent solution to your tooth loss concerns, it’s time to explore a better restorative option: all on 4 dental implants in Dallas! This solution can last a lifetime and provide a brand-new smile for you to look and feel great about. There are many patients that turn to dentures because it’s been the traditional way to address excessive tooth loss. However, when you explore all on 4 implants, you can actually combine your denture prosthetics with stabilizing implant posts. This is a restorative dental option is a modern way to ensure that you don’t have to deal with the issues that traditional dentures pose, like slippage or falling out while eating and/or talking. It might seem too good to be true: a whole new smile with little to no problems? Believe it or not, it gets even better than that. Dental implants have a high success rate of upwards to 95% or higher, meaning that you have a great chance of restoring your teeth in an effective, long-lasting way. To be honest, many patients make the perfect candidate for all on 4 implants. More and more American adults are losing their teeth, unfortunately. However, if you’re completely edentulous (don’t have any more existing teeth), and if you’re committed to improving your oral health again, dental implants are most likely the best option for you. There are some technical things that your dentist will need to discuss, like if you’re a smoker (you should quit if you want implants), or if you have bone loss in your jaw. Whatever the “hiccup” is that is stopping you from moving forward, your dentist may be able to work with you to get your oral health up to par to receive the implant procedure. Are you ready to proceed with all on 4 implants? Discussing the cost, your insurance, and your current lifestyle with your dentist is the very next step. Feel free to schedule a consultation today! Here at Kwon Dental, we only offer the best solutions to patient’s dental concerns—solutions that will last for years to come! That’s why all on 4 implants are highly recommended in our office for patients who are just about to lose hope on the idea of having a complete smile again. Contact us today so that we can help you, too. Comments Off on Can I Combine Dentures and Dental Implants in Dallas?